Speaking of those early days, it’s kind of amusing how the media was then preoccupied with trivial matters such as the “wang-wang” issue. Instead, what generally pervaded at that time was hope that the voters were right in trusting their country’s fate on the son of illustrious leaders; that President Noynoy will live up to the legacy bequeathed on him and make a difference especially in the lives of the less advantaged while in the process of retrieving the country from the sorry mess that predecessors had left it. Picking up on the legacy thing, President Noynoy seemed to choke up recalling how his late father Sen. Benigno Aquino Jr. inculcated in his mind the conviction that “the Filipino is worth dying for.” As a matter of fact the Filipino is worth living and fighting for, Aquino added. At the same time he expressed concern about the gravity of the nation’s problems and the possibility that something or someone might steer the nation back to the old corrupt ways. He said: “Should those times happen and I am on my second life, can I tell myself I am happy with what I had accomplished?” The “second life” is a reference to the 1989 coup against his mother, President Corazon Aquino, when soldiers led by renegade colonel (later senator) Gregorio Honasan peppered Noynoy with bullets that almost caused his death. But even while President Noynoy was highlighting the economic gains and other achievements of his four years in office, huge crowds of disgruntled Filipinos both young and old from all walks of life were carrying protest signs and holding their own SONAng Bayan (People’s SONA) along the length of Commonwealth Avenue from Philcoa to Sandiganbayan and along Batasan Road. They were kept at bay by coils of razorwire, heavy duty steel and concrete fences guarded by thousands of policemen and soldiers, it was said. Obviously, the honeymoon years between cause-oriented groups and P-Noy is now just a memory. They now branded him as “pork barrel king” for his role in the DAP (Disbursement Acceleration Program) and PDAF (Priority Development Assistance Fund) mega anomalies. Before it was burned, the giant “HolDAPer” effigy was a likeness of P-Noy sitting on a throne carried by marchers along Commonwealth Avenue and pelted by angry protesters. The common folks may have reasons to complain. It is indeed incredulous why the big majority of our people in the homeland still live miserable lives considering that the administration have been boasting about the Philippines being already an economic tiger. According to the IBON Foundation, Inc. official figures grossly underestimate poverty which, if corrected, would show anywhere between 38-68 million poor Filipinos which is the worst scale of poverty in the country’s history. Life is still difficult with countless Filipinos, many laws are selectively implemented, Metro Manila floods with the slightest rainfall, unscrupulous folks continue to ravage our forests and mineral resources, the Ampatuan massacre case is still dragging its feet and human trafficking, illegal recruitment, corruption and other crimes go unabated. P-Noy is still stubborn in backing to the hilt his so-called “kakampi, kaklase and kabarilan” (party mates, classmates and shooting buddies) who may have figured in some irregularities. It seems that whatever economic upsurge the country may have attained had been heaped on the lucky few at the helm of government and big businesses. And again there was the ‘pork’ thing, obviously one of the reasons why political dynasties proliferate. Politicians want their families to get as much of the PDAF pie. The fact that there are now cases against those allegedly involved — a few of them anyway who just happen to be in the opposition — is no thanks to the administration. It came about only because a civilian whistleblower revealed it. After all Noynoy Aquino was for four years a member of Congress and never raised as much as a peep of protest against the enormous anomaly that had been under wraps for so long. And P-Noy’s discretionary funds that may not be subject to audit is considered so huge it makes all the other ‘pork’ combined look like malnourished midgets. That may also be the reason why P-Noy refused to certify the FOI bill as urgent; not until now that rotten skeletons are already out of the closet. There were other ingenious ploys to steal the people’s money. There were lies about the P139 billion Malampaya fund which the administration initially said was still intact only to be proven wrong. Defending the thief and/or misappropriations of enormous amounts of public funds in the unconstitutional DAP and PDAF only makes matters worse for the sitting president. 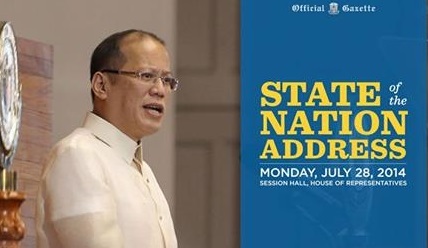 President Noynoy had delivered his second to the last State of the Nation Address at a time when his approval ratings are at their lowest and he is facing three impeachment cases regarding his DAP and the Enhanced Defense Cooperation Agreement (EDCA). Will the same number of people who believed in him before still cover his back?